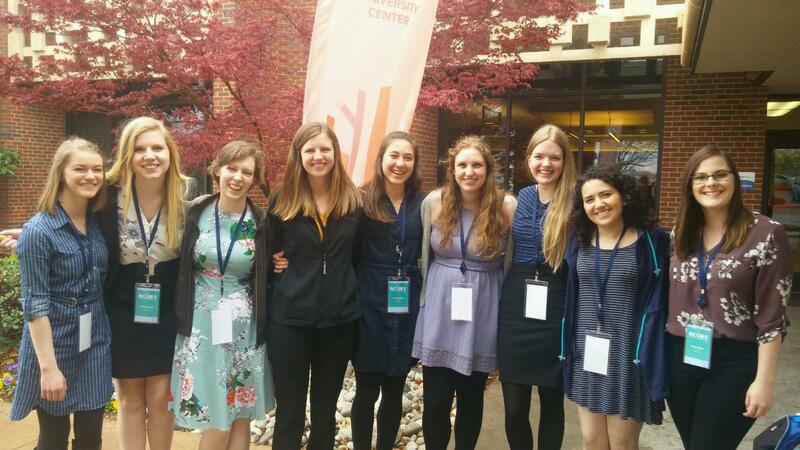 Marta Williams ('19), Cassidy Woods ('18), Lily Kime ('19), Kelly Kennedy ('18), Ananda Easley ('19), Katie Patyk ('18), Kaitlyn Buls ('19), Laila Sahir ('18), and Nicole Weber ('18) attend the National Conference on Undergraduate Research in Oklahoma. Nine Luther students attended the National Conference on Undergraduate Research at the University of Central Oklahoma in Oklahoma City, Oklahoma from April 4-7. 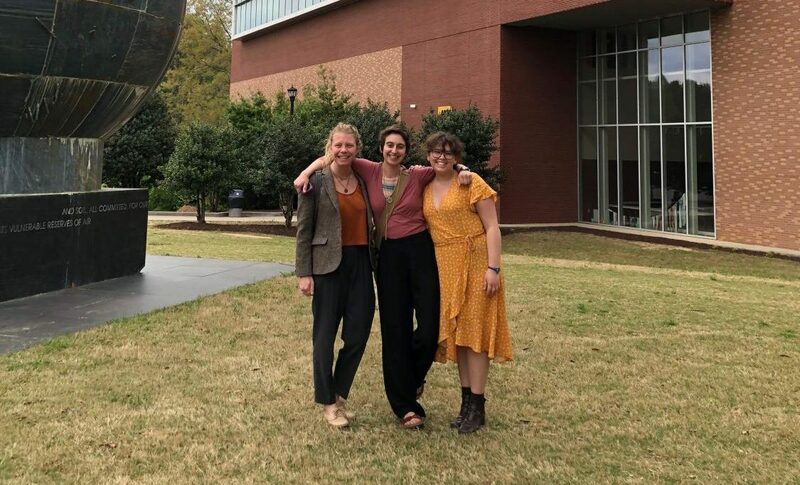 Additionally, three students presented at the Kennesaw State University Undergraduate Philosophy Conference on April 13 and 14 in Kennesaw, Georgia. Laila Sahir (‘18), Kelly Kennedy (‘18), Katie Patyk (‘18), Nicole Weber (‘18), Cassidy Woods (‘18), Kaitlyn Buls (‘19), Ananda Easley (‘19), Lily Kime (‘19), and Marta Williams (‘19) presented at the NCUR. Rachel Brodeur (‘18), Jamie Herman (‘18), and Marcella Meza (’18) presented at the philosophy conference. More than 4,000 undergraduate students from across the country and students from 19 other countries presented at the NCUR conference. Professor of English and Faculty Advisor at NCUR Lise Kildegaard expressed her pride for all the presenters. NCUR focuses on multiple divisions of research — arts and humanities, biology, chemistry, education, engineering, geosciences, health sciences, mathematics and computer science, physics and astronomy, psychology, and social sciences — and has opportunities for students to give oral or poster presentations. Sahir gave an oral presentation titled “Gender and Performance in Marie Antoinette.” Her project evolved from her performance in Shakespeare’s “Twelfth Night” during fall of 2016. Her idea started with the cast’s discussion of gender roles and how they affect a performance. Williams gave a poster presentation titled “Implications of Micra Leadless Pacemaker Extraction for Tricuspid Valve Integrity” and an oral presentation titled “PI3K/AKT Signaling Influences Neuronal Function in C. elegans.” Williams worked with Assistant Professor of Biology Stephanie Fretham (’05) on her C. elegans research. She also worked with graduate students and mentors at the University of Minnesota at Minneapolis last summer in her research on tricuspid valves. Jamie Herman (’18), Marcella Meza (’18), and Rachel Brodeur (’18) present their research at a philosophy conference in Georgia. To apply to attend NCUR, students submit an abstract of their work to the Dean’s office, which then chooses abstracts to submit to NCUR. NCUR organizers then email students of their acceptance to participate at the conference along with specific information regarding when and where they will present. Brodeur, Herman, and Meza each presented their research at the philosophy conference in Georgia. To deliver their presentations, all 13 student presenters sat at a round table and read their papers to the other presenters, the moderator, and the keynote speaker. They discussed each presenter’s topic in depth. At the philosophy conference, Herman presented a paper she wrote for her Ancient Philosophy class fall of 2017 on two pre-Socratic philosophers and how they present their views regarding who can acquire knowledge. Herman enjoyed her time at the philosophy conference and looks forward to Luther’s Student Research Symposium on May 11. Buls, who presented a version of a paper she wrote for an English class at NCUR, provided advice for students looking to conduct their own research.